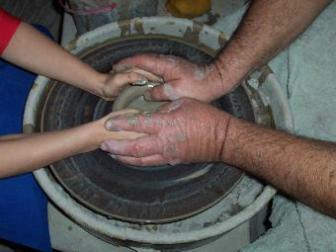 Welcome to Brown Pottery & Sons! Welcome to JerryBrownPottery.com! If you love history, if you love art, and if you love something "different," you’ve come to the right place! Stop and visit awhile online with us. Do a little shopping while you’re here. But even better than that, come visit us at Brown Pottery & Sons. Sit a spell. Make your picture with Blue. Watch tenth-generation potter Jeff Wilburn turn pieces of pottery. Take a tour with Sandra. In the springtime, enjoy the nearly 200 purple martins who call Brown Pottery & Sons home. 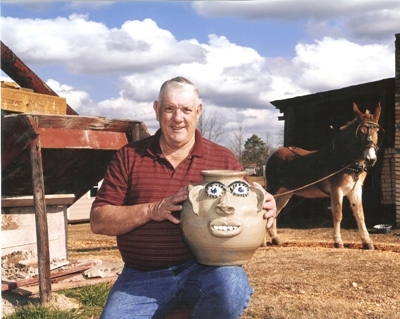 In 1992, Jerry Brown was awarded the National Heritage Fellowship and currently has five pieces of pottery on exhibit in the Smithsonian Institute in Washington, D.C. The Alabama State Council on the Arts awarded the Alabama Folk Heritage Award to him in 2003. Also, in 2003, the Jerry Brown Arts Festival was created in his hometown of Hamilton, a juried arts festival which has been recognized as a Top 20 event in the Southeastern U.S.